The ground rollers are a small family of non-migratory near-passerine birds restricted to Madagascar. 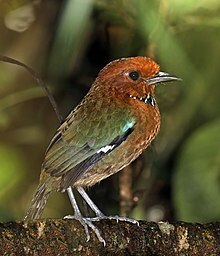 They are related to the kingfishers, bee-eaters and rollers. They most resemble the latter group, and are sometimes considered a sub-family of the true rollers. Ground rollers share the generally crow-like size and build of the true rollers, ranging from 25–49 centimetres in length, and also hunt reptiles and large insects. They are more terrestrial than the Coracidae species, and this is reflected in their longer legs and shorter, more rounded wings. They lack the highly colourful appearance of the true rollers, and are duller in appearance, with striped or flecked plumage. They are much more elusive and shy than their relatives, and are normally difficult to find in the Malagasy forests. Often the hooting breeding call is all that betrays their presence. These birds nest as solitary pairs in holes in the ground which they excavate themselves, unlike the true rollers, which rarely nest in ground holes and even then do not dig their own nests. mtDNA analyses confirmed the systematics of this group but indicated that merging Geobiastes into Brachypteracias, as was usually done since the 1960s, should be reversed at least until a more comprehensive review (e.g. supported by fossils) is possible (Kirchman et al., 2001). Also, 2000-year-old subfossil remains of ground rollers are known from the Holocene of Ampoza (Goodman, 2000); Eocene remains from Europe at first tentatively assigned to this family were later recognized as quite distinct (Mayr & Mourer-Chauviré 2000). Presently, there is no indication that ground rollers ever occurred anywhere outside Madagascar (Mayr & Mourer-Chauviré, 2001). ^ a b c Forshaw, J.; Kemp, A. (1991). Forshaw, Joseph (ed.). Encyclopaedia of Animals: Birds. London: Merehurst Press. p. 147. ISBN 1-85391-186-0. This page was last edited on 13 January 2019, at 18:12 (UTC).